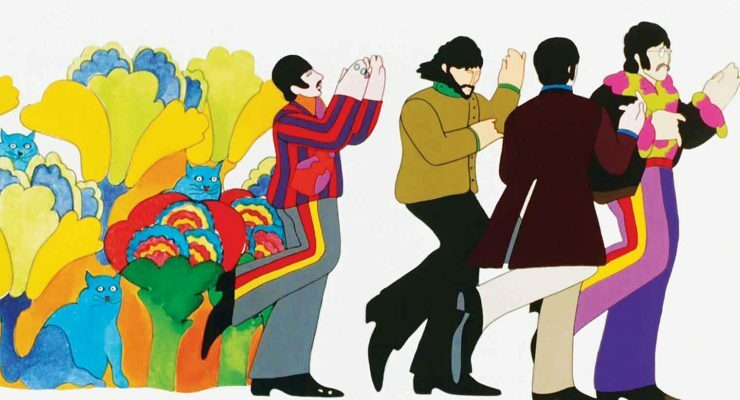 Yellow Submarine - Upstate Films, Ltd.
Once upon a time — or maybe twice — there was an unearthly paradise called Pepperland… In honor of the 50th anniversary of this Beatles classic, Upstate presents the newly restored theatrical version with remixed 5.1 Stereo Surround Sound. Pepperland’s peaceful harmony is shattered when the Blue Meanies invade with their army of storm bloopers, apple bonkers, and snapping turtle turks. But it’s The Beatles to the rescue as our animated heroes journey across seven seas to free Sgt. Pepper’s Lonely Hearts Club Band and restore music, color, and love to the world. An exhilarating cinematic experience for all ages, YELLOW SUBMARINE is filled with invention, optical illusions, word play, and glorious, glorious music. From the paper-doll residents of Pepperland to the tinted photography of the soot covered roofs of Liverpool, the menagerie of characters in the Sea of Monsters, the kaleidoscopic rotoscoping of Lucy in the Sky with Diamonds, the op-art of the Sea of Holes, and the triumphant euphony of the It’s All Too Much finale, the film is simply a joy. G / 1 hr 25 mins.